When my kids were younger, I remember reading to them a funny little book called "There Was an Old Lady Who Swallowed a Fly" by Pam Adams. It started with the woman swallowing a fly. Then, with each page, it added something new. By the end of the book, there was one very long sentence about all the different things the woman had swallowed. 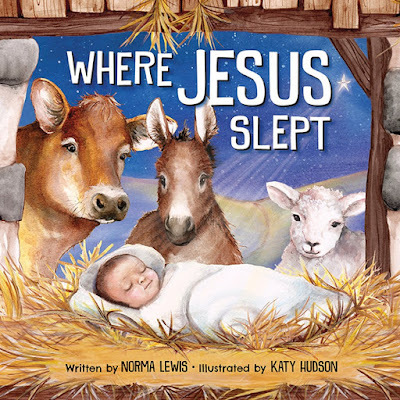 I immediately thought about that book when I first started reading WHERE JESUS SLEPT by Norma Lewis, because it is the same cumulative type of story. This is the cow that shared the straw that lined the bed where Jesus slept. It starts with Jesus sleeping sweetly in a manger, and ends with the wise men bringing Him gifts. (I personally believe the wise men did not come to the stable on the night Jesus was born, but that is a minor detail). Children will love the repetition of this story, as well as the appealing illustrations. Enter below for a chance to win a copy to share with your kids and/or grandkids this Christmas season. (U.S.A. addresses only). Giveaway ends Saturday, November 5, 2016, at 8:00 p.m. CST.